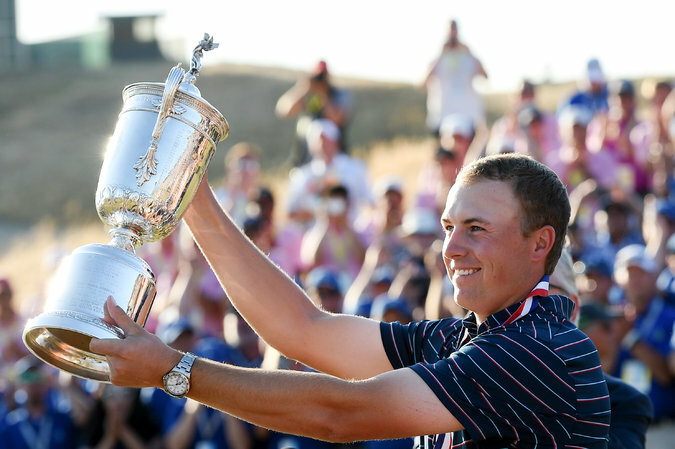 First of all a big congratulations to the 2015 U.S. Open Champion Jordan Spieth on his victory this weekend at Chamber’s Bay. Although I do feel for Dustin, he did play brilliantly all week, but sometimes that’s just the way it goes when it comes to major championships. With all of the chatter surrounding the Chamber’s Bay course design, the difficult conditions and that spectacular finish, the USGA definitely got the drama they wanted. If they had to play a course like Chamber’s Bay every week, they would indeed have very short careers. The mental energy required to play well at this course in unbelievable – a real grind from the first hole to the 72nd. Watching a finish like that in a major brings me back to the 1970 Open Championship at St. Andrews, with Jack Nicklaus and Greg Sanders. The Sunday battles between the greats in major tournaments like this are great for the game of golf. Certainly more exciting for the average fan watching at home when the winner is decided by a margin of inches. Also reminds me of Scott Hoch and the 1989 Masters (at left), and his missed 2-footer to lose the playoff to Nick Faldo. Jordan Spieth could become an absolute superstar. The composure and confidence he exudes in every tournament he plays is one of the reasons he has won his second major this year. It’s hard to believe that this time last year, he wasn’t even old enough to enjoy a pint at the 19th hole. The fact that he is already breaking records held for over a century, from the likes of Bobby Jones, Gene Sarazen, as well as being the first player to win the Masters and the U.S. Open since Tiger in 2002. It certainly wasn’t an easy win for Spieth with Dustin and Louis Oosthuizen fighting until the end, as well as Adam Scott’s spectacular final round 64. Jordan’s sheer brilliance under pressure pulled through – and remember – he didn’t have his best stuff for most of the week – but he had it when he needed it. 1. Use on-course strategy to keep yourself out of fairway bunkers from 100yds to 30yds short of the green – these are without a doubt the most difficult shots in golf. Even for the pros. 2. Don’t forget to practice the long lag putts. Look how many of them the pros had this week – amateurs never practice these putts enough and invariably end up 3-putting or worse. 3. If the course conditions are tough, embrace the conditions – don’t complain about them. Don’t forget, its the same conditions for everybody! I stumbled upon David Leadbetter’s book, “The A Swing” through an Amazon Books suggestion. I absolutely love reading golf books hoping to find a solution to my terrible golf swing. I can’t tell how many of my friends constantly remind me that I have a waggle at the top of my swing that severely affects my ball striking. I’m always looking for a swing that is easy, repeatable and produces great results most of the time. Well, as you can guess, I would always feel good trying a new swing the first few times but eventually would go back to my old habits of coming over the top and slicing again. The one thing all those books had in common was a conventional either one or two plane backswing. The A Swing is much different. It is only conventional looking on the downswing and followthrough. The backswing is the key to ensuring a successful downswing. The more natural the movement the easier it is to repeat. After reading about the A swing I was a little bit worried that the awkward takeaway was going to be hard to duplicate and repeat. But Mr. Leadbetter explains it best when he uses the analogy of a baseball swing. How is it that a baseball player can hit a fast moving ball with a club that starts off plane? One would think it easier to start the bat onplane. Fortunately, the offplane swing has already been proven many times to be successful and repeatable. So, I started practicing the 7 minute drill to get a good feel for the pivot move. I must say the best drill is number 6 where you practice the swing with your eyes closed. It’s amazing how much more you notice your hip rotation when you close your eyes. I feel like I could almost hit balls blind folded. I have had only 2 chances to try the swing on a driving range because I’m currently on a business trip. Both times not only did I see instant results but I never, let me say again, NEVER sliced the ball. I also hit the ball almost 1.5 times further with each club except the driver. The driver swing has a little variance to the iron swing that I don’t quite have down yet. I still hit it fairly straight but no real distance improvement. But with my irons, I’ve never hit the ball so pure as many times during one driving range session. I can’t wait to get home and try the swing on the golf course. I have only scored in the 80’s once in the last 12 months. I will post again if I’m successful lowering my score. Thank you David Leadbetter. Your new swing is more natural than any golf swing I have ever tried.